This Bellaterra Home bathroom vanity with sleek design, will bring refreshing look to any bathroom. The recessed sides of the cabinet makes this unit more interesting. It has 4 functional drawers and 2 door panel with a interior self. Solid hardware in brush nickel finish, installed with top quality soft-closing hinges and full extension drawer glides. The bottom oversize drawers have a interior tray which make storing small items much easier.Constructed with a sturdy solid wood frame, it is built to last for years. Faucet and mirror not included. Professional installation recommended. 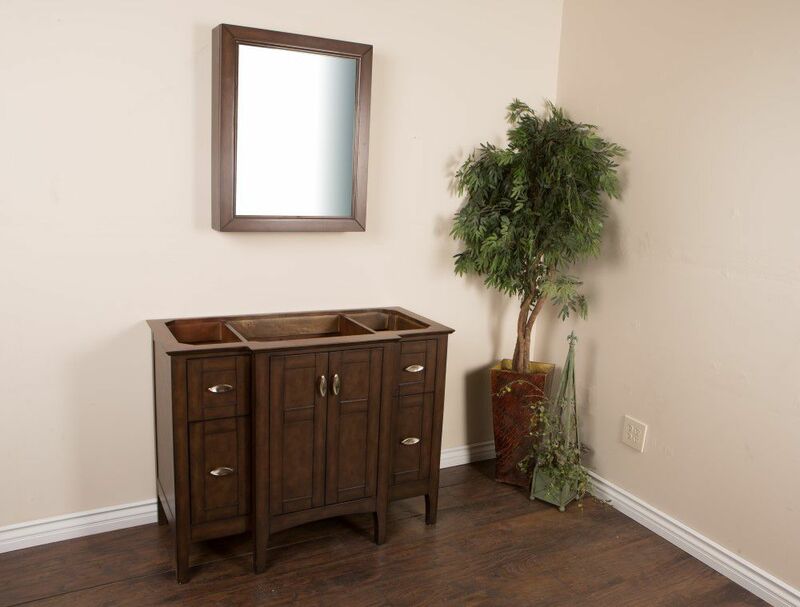 Enrich your bathroom ambience with this upscale 36-inch mahogany vanity that is more affordable than it looks. With a rich, dark finish and a clean, sleek profile, this modern piece has an understated elegance that will impress homeowners and guests alike. Two cabinet doors with soft-stop bumpers and three right-side drawers open up a bevy of storage options for linens and bath essentials, setting the tone for a tidy powder room. The sturdiness and craftsmanship of this vanity cabinet will make you think it is custom-built, while small details like leg levelers instill confidence for perfectly stable setups. Browse through the Foremost Ashburn collection for complementary mahogany items like wall cabinets and mirrors for a complete bathroom makeover. Awash with a warm cinnamon finish, this 48-inch vanity cabinet is full-bodied and sits flush with the floor. It is an attractive, elegant piece with an affordable price that belies its upscale look. Two large double doors and three right-side drawers are equipped with black birdcage-style handles that give it a vintage appearance. The solid, seamless construction gives homeowners and contractors the sense that it is custom-built, while the generous storage space within accepts bathroom accessories aplenty. Cap this furniture-style bathroom vanity with a top/sink/faucet combination that ties the room together. Browse the Foremost Naples lineup for mirrors and wall/linen cabinets in the same cinnamon finish. Enrich your bathroom ambience with this upscale 36-inch mahogany vanity that is more affordable than it looks. With a rich, dark finish and a clean, sleek profile, this modern piece has an understated elegance that will impress homeowners and guests alike. Two cabinet doors with soft-stop bumpers and three left-side drawers open up a bevy of storage options for linens and bath essentials, setting the tone for a tidy powder room. The sturdiness and craftsmanship of this vanity cabinet will make you think it is custom-built, while small details like leg levelers instill confidence for perfectly stable setups. Gaze through the Foremost Ashburn collection for complementary mahogany items like wall cabinets and mirrors for a complete bathroom makeover. Bellaterra Home 44-Inch Vanity Cabinet in Sable Walnut This Bellaterra Home bathroom vanity with sleek design, will bring refreshing look to any bathroom. The recessed sides of the cabinet makes this unit more interesting. It has 4 functional drawers and 2 door panel with a interior self. Solid hardware in brush nickel finish, installed with top quality soft-closing hinges and full extension drawer glides. The bottom oversize drawers have a interior tray which make storing small items much easier.Constructed with a sturdy solid wood frame, it is built to last for years. Faucet and mirror not included. Professional installation recommended.